August 1, 2011: When a NASA spacecraft goes into orbit around a new world for the first time, the control room is usually packed to capacity with scientists, engineers, and dignitaries ready to leap and shout when the retro-rockets fire. It's a big, noisy event. July 15, 2011, was one of those days. 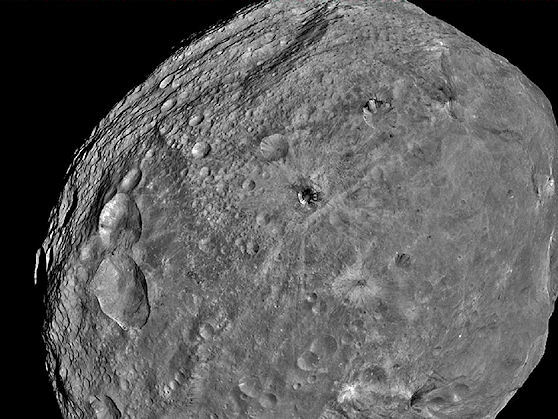 NASA's Dawn spacecraft approached Vesta and became the first probe from Earth to orbit a main belt asteroid. Dawn's cameras revealed a desolate world of transcendent beauty, thrilling everyone who worked on the project. Needless to say, the control room was .... silent? "Actually it was empty," says Dawn Chief Engineer Marc Rayman of JPL. "Dawn entered orbit on a Friday night; I myself was out dancing with my wife and friends." Using its framing camera, Dawn obtained this image of Vesta on July 24, 2011, from a distance of about 3,200 miles (5,200 kilometers). The three vertically-aligned craters on the left have been nicknamed "the snowman" by camera team members. Press release: Dawn Begins Science Orbits of Vesta. What gives? Rayman, an avid folk dancer, explains: "Our mission has a unique choreography." Indeed, Dawn has its own way of doing things. While most spacecraft blast off Earth atop a firestorm of conventional rocket exhaust, then coast to their destinations with engines turned off to conserve fuel, Dawn was able to continue thrusting throughout its voyage. Fuel-efficient ion engines gently propelled the spacecraft toward Vesta for more than three years, never exerting more force than the weight of a feather held in your open palm yet, over time, gathering enough speed to catch an asteroid racing halfway across the solar system. With engines firing almost constantly, mission controllers were able to actively steer the probe, gradually reshaping Dawn's orbit around the sun until it matched the orbit of Vesta itself. Meeting Vesta for orbital insertion wasn't a jarring encounter of mismatched velocities. It was more like two dancers merging in practiced rhythm to a familiar tune. "Dawn did not miss a beat as it flew into Vesta's grasp," says Rayman. "The spacecraft moved gently into orbit with the same grace it has displayed during its nearly 1000 days of ion propulsion through the solar system." The capture was so smooth, so low-key, that personnel felt no particular need to monitor the probe's operation. "I really was out dancing," says Rayman, "confident that the pas de deux being performed 188 million kilometers away would be executed with graceful beauty and flawless precision." Calculations show that the moment of "orbit insertion" occurred on Friday night, July 15th, around 9:47 pm PDT. At that moment, Dawn's orbit around the sun finally was so close to that of Vesta that the protoplanet's gravity could take hold of it. Radio signals picked up on schedule by the Deep Space Network later confirmed that the spaceship and asteroid were truly a pair. Dawn will spend the next year circling Vesta in a series of descending passes, bringing the giant asteroid's ancient surface ever closer to Dawn's cameras and other science instruments. Because Vesta is a relic of long-ago planet formation, the history of our solar system could be revealed under Dawn's careful scrutiny. "This really beautiful dance," says Rayman, "is just getting started." Credits: Dawn launched in September 2007. Following a year at Vesta, the spacecraft will depart in July 2012 for Ceres, where it will arrive in 2015. Dawn's mission to Vesta and Ceres is managed by JPL for NASA's Science Mission Directorate in Washington. JPL is a division of the California Institute of Technology in Pasadena. Dawn is a project of the directorate's Discovery Program, managed by NASA's Marshall Space Flight Center in Huntsville, Ala. UCLA is responsible for overall Dawn mission science. Orbital Sciences Corp. in Dulles, Va., designed and built the spacecraft. The German Aerospace Center, the Max Planck Institute for Solar System Research, the Italian Space Agency and the Italian National Astrophysical Institute are international partners on the mission team.